All frogs require some protection from predators and inclement weather. To be helpful, frogs must use shelters that are easy to access within the bounds of their habitats. Some species seek shelter in leaf litter, while other choose to hide in the tree tops or in water. Some enterprising frogs take shelter in debris or buildings they find in residential areas. Many terrestrial frogs take shelter in the leaf litter of the forest floor. Rich in invertebrates and moisture, the leaf litter is a very nurturing environment for frogs. While the leaf litter provides the frogs with a place to hide and escape climatic extremes, it doesn’t provide much protection if a predator finds them there. American toads (Bufo americanus), cricket frogs (Acris ssp.) and wood frogs (Lithobates sylvatica) are species that frequently use the leaf litter as shelter. Frogs often use rocks, logs and tree stumps for shelter. These types of locations offer the highest level of protection from both predators and the elements, though they take more energy to get into and out of. Accordingly, these types of shelter often serve as hibernacula in the winter. Most tree frogs find shelter in the trees. High off the ground, the increased airflow keeps the temperatures more hospitable for frogs in the heat of the summer. Some, such as grey tree frogs (Hyla chrysoscelis), nestle themselves into the furrows of tree bark and use their camouflage to protect them from predators. Others, including green tree frogs (Hyla cinerea), use their green color to camouflage amid the leaves of the trees. Out on the tips of the branches, the frogs must hold on tightly as the branches blow in the breeze. Aquatic frogs derive some protection from the water itself: to avoid a flying bird or bat, a frog must merely submerge several feet to be safe. However, the water carries its own predators, and frogs living in ponds and rivers must avoid predatory fish and water snakes. Frogs use underwater shelters such as rock crevices, rotted logs and the detritus at the bottom of water bodies. Leopard frogs (Lithobates sphenocephalus), bull frogs (Lithobates catesbeiana) and green frogs (Lithobates clamitans) are common aquatic frogs that find shelter in the water. Some frogs -- for example spadefoot toads (Scaphiopus ssp.) -- are excellent diggers. These frogs dig burrows into the substrate in which they spend most of their time. When frogs dig, they usually do so with their rear legs; sometimes, as with spadefoot toads, their back feet possess hard spurs that help them to dig. 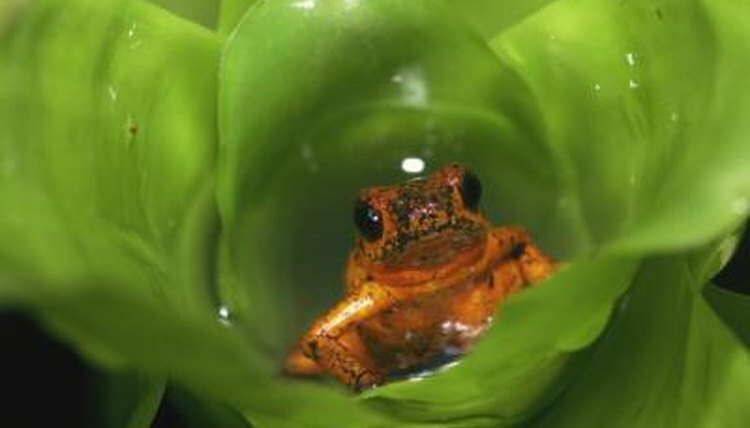 Frogs are adaptable animals, and they occasionally utilize unusual shelters. Many frogs frequent suburban habitats, such as gardens, backyards and koi ponds. When living in these habitats, they will find shelter under tools, inside storage containers and on garden plants. Frogs occasionally stow away in cargo, eventually ending up in areas far outside their natural range.